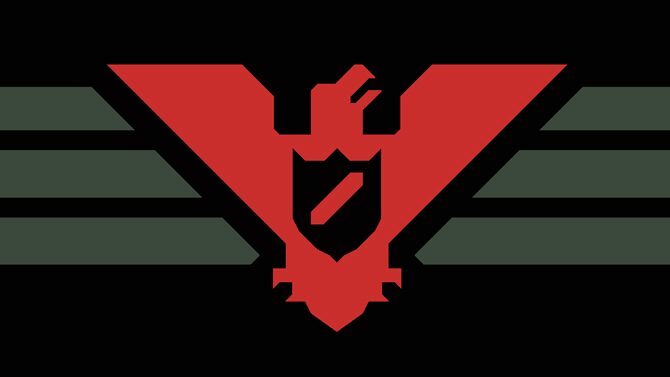 I’ve always been averse to mystery games—nothing about the genre or gameplay itself, but more so my own inability to commit to making any conclusions. My indecisiveness has an irrational fear for me of any games that involve solving mysteries, with the possibility of consequences. Just look at my unfinished save files of L.A. Noire and Heavy Rain. Having heard word of mouth of what Return of the Obra Dinn was about, I couldn’t help but feel a bit intimidated when I started my first playthrough. I can confirm that this fear did return while playing this game, but rather than putting me off, Obra Dinn pulled me in. 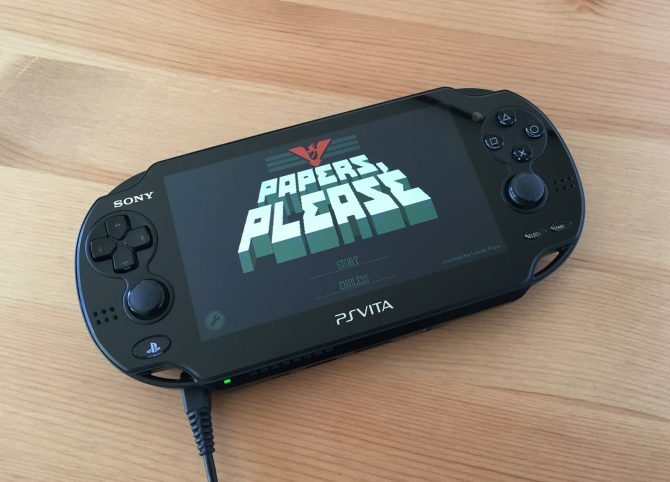 There is nothing in Lucas Pope’s follow-up to Papers, Please that suggests that it was meant to be a horror game, yet this mystery title crept under my skin more than anything else from 2018. Every visual element and sound effect created something that makes me think of the word “immersive,” but legitimately and not as the buzzword it usually is. 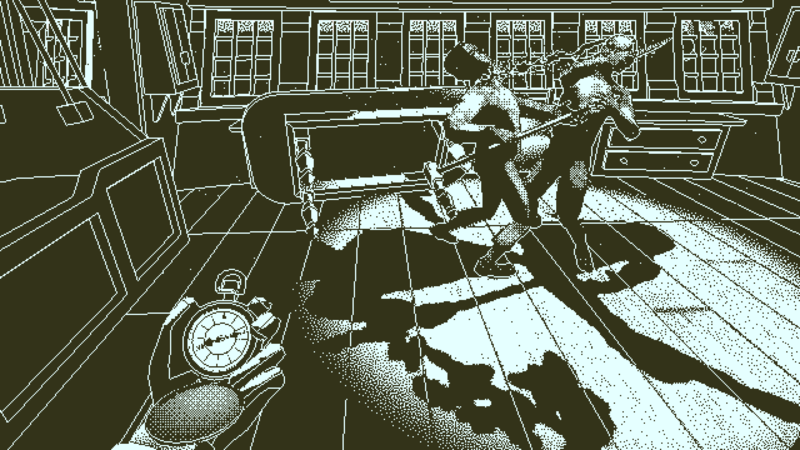 And unlike those two studio mystery titles that I mentioned before, Return of the Obra Dinn made me feel like I was truly in control of an investigation, and I felt the freedom to approach it from different angles rather than selecting something from a multiple choice question. The good ship Obra Dinn has reemerged six years after its mysterious disappearance, and the player character, an insurance adjuster, has been tasked with investigating the vessel and determining the fates of the sixty-something inhabitants on the ship. Playing as an insurance agent on an empty boat may not sound like the most lavish premise at first, but just one use of the Memento Mortem device will demonstrate how thrilling the game is. Upon finding human remains on the ship, this “Memento Mortem” pocket watch will allow the player to listen to the death of that person, ending with a free look at the surrounding environment at the moment of death. It’s a moment frozen in time, and with bombastic music playing in the background and with actions displayed in the most intensely dramatic way possible. It feels like you’re walking around in a Renaissance painting of sorts. These memories of horror, betrayal, and extreme violence are merely the pieces of this grand puzzle that the player must solve. 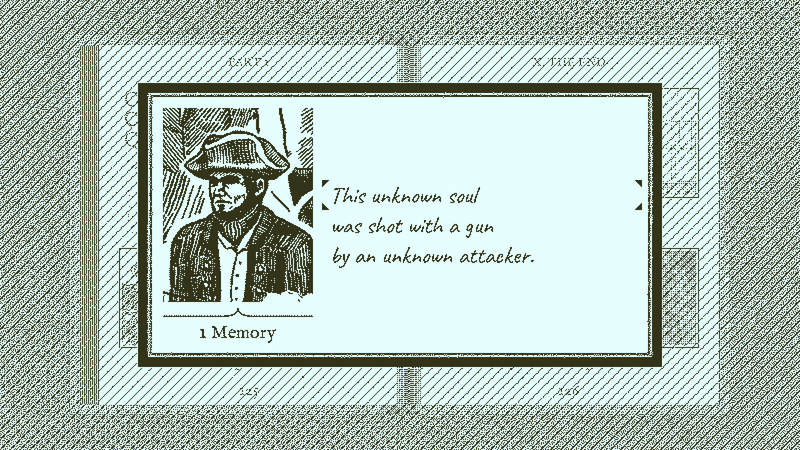 With a crew manifest and some artistic renditions of the crew and passengers on hand, the player must determine not only the identities of each person in these memories but the method in which they died and the identity of the person responsible. All in all, you just have to figure out what the hell went wrong here. Some mysteries are significantly more difficult than others, but Return of the Obra Dinn gives you the right amount of information to go about this, at least for the most part. I enjoy thinking about a cliche when talking about writing for film: a scene is considered to be successful if it does more than one thing. 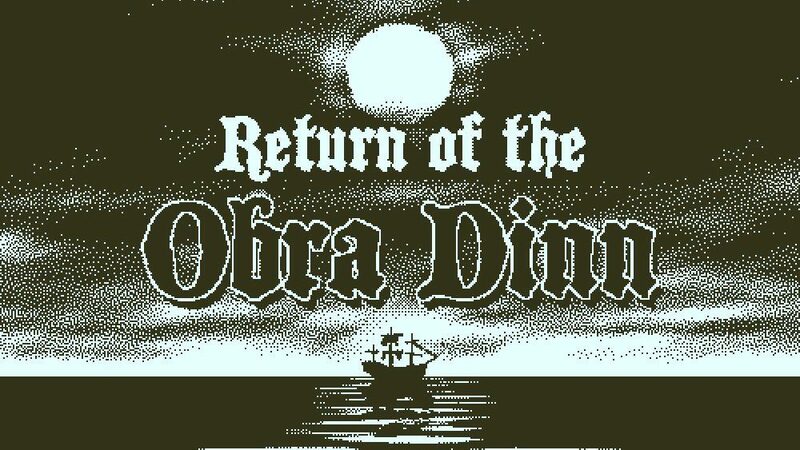 Yes, Return of the Obra Dinn is not a film, and it in no way resembles one and takes full advantage of the interactive medium, but I did think of that cliche while viewing the many memories in this game. So many of these dioramas of murder had a wealth of details to extrapolate—even just one single moment has multiple layers that can branch off into deductions for other parts of the story. The game’s story has the player start from the ending and meeting up with the middle of the narrative, according to the unfinished log book that the player has been provided with at the beginning. It’s a bit like playing a video game version of Christopher Nolan’s movie Memento. Even without the imagery provided by the memories, the placement and distance between bodies, the trails of blood left behind, and so on tell their own story. There have been other games that have used the “frozen moment in time” element as a gimmick (i.e. Batman: Arkham Origins), but unlike those games, you are not slavish to a path and order in which you must find clues. The “easiest” memories will probably have a character stating someone’s name—a slightly more difficult one will have someone shouting someone’s name, and the player will have to walk around and observe someone reacting to that call with their hand on their ear. But as you get deeper into the story, you’ll find yourself juggling between pages of the logbook, looking back at different memories, and cross-sectioning different events together. It becomes more of a puzzle than a mystery, and logging three correct “fates” in the book will have them all confirmed and give a satisfying music jingle. A couple of hours in, I made the decision to play the game with headphones, and it paid off in many ways. The sound design and foley work are remarkable and it characterized the pure unsettling feeling I had playing most of the game. Murder and bloodshed have never sounded this good before. From the sounds of bullets and shells to blades penetrating flesh and the squelches and agony of the about-to-be deceased, even without visuals, these moments were a sensory wonder. It also helps that the voice acting was pretty darn good. Mind you, I wasn’t around in England circa 1802 and am no expert in linguistic and accent authenticity, but the short character moments we got from these memories were convincing an easy to take seriously. I was satisfied enough by the creaking of the ship on the water as I walked around, but I greatly appreciated how different this noise felt as I explored the lower levels of the ship. 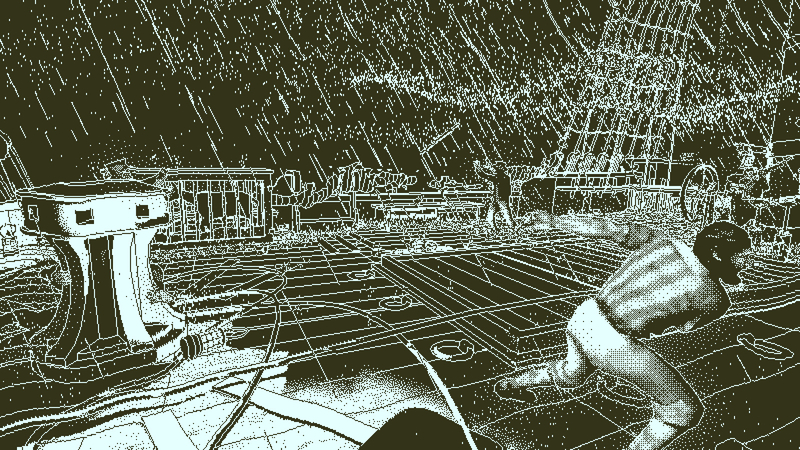 The game may not have a photorealistic look, but the sound alone made Obra Dinn a much more visceral experience. That isn’t to knock on the visuals, as I enjoyed them just as much. There’s a lo-fi, monochromatic Macintosh feel to the look, with a dithering “dots” effect that gave the game some character and some visual flair. It’s not a look I’m particularly nostalgic for (I wasn’t around those days), but in a way it helped me to focus on certain details during my deductions: facial expressions, body language, and distinct features like tattoos and whatnot. And I can’t put my finger to why exactly, but the art style made it so whenever something appeared out of the ordinary, it became even more shocking and unsettling. I could be in the minority when saying this, but I felt that the thrill faltered closer to the endgame. I revisited many of the memories to gather details that I may have missed, but the excitement of experiencing them for the first time simply could not be replicated. Granted, the thrill at this point is meant to be from solving the mystery, but not everyone will quite get a kick out of that as much, especially when my love from the game depends so much on those sensory details. There are also points where Obra Dinn really makes you stretch, or some clues are a bit more far-reaching than you’d hope they would be. This game does encourage some guessing, and crew members who are more difficult to identify are properly labeled as such. Still, I didn’t know that I would have to be paying attention to small tags on hammocks and the patterns of socks on some people. 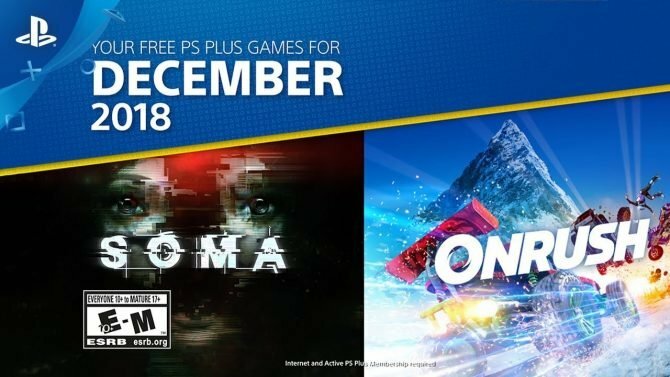 Regardless, I will revisit this game with new perspectives and angles to approach it from—I feel I have some unfinished business, and I feel a determination that few games give me.